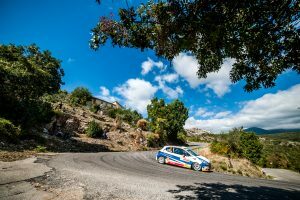 Filip Mareš is not giving up on winning the FIA ERC Junior Under 27 title – and the 100,000 euros career progression fund on offer to the champion – when Rally di Roma Capitale resumes today. Mareš is third in the table for the ACCR Czech Team after an impressive first season in the European Rally Championship. “The title is possible but really difficult although, like everyone, I am here to win and I will do my best,” said Mareš.